Sparkling wines and Champagne are the most versatile wines for pairing with food. A well-made bubbly has lots of natural acidity, which helps it brighten the flavors of so many foods and be a perfect food companion. These wines based on their region of production and the winemaker can have different styles, which vary from sweet to dry with different level of alcohol and residual sugar, hence providing a range of different options when it comes to pairing them with food. In the pantheon of sparkling wines, Champagne has always stood at the top. 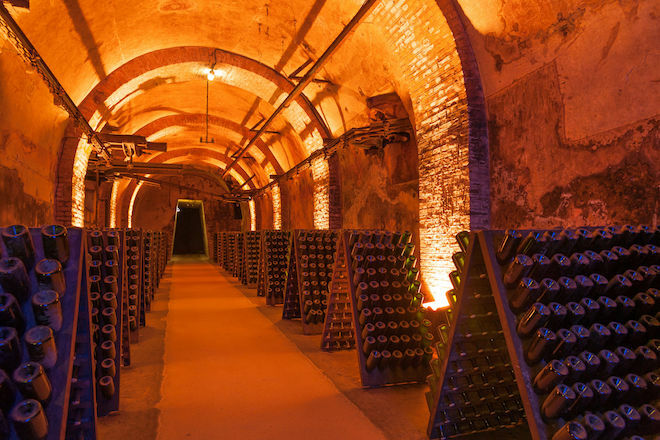 Though good, even great, sparkling wines can be made in many parts of the world, in the Champagne region of France, the best wines attain a sort of special rank. The three main grapes used to produced Champagne are Chardonnay, Pinot Noir and Pinot Meunier. France also produces Crémant which refers to all sparkling wines produced by méthode classique i.e. the traditional-method, outside the Champagne region. Crémant can be made from grapes other than the traditional Champagne varieties. Crémant d'Alsace, for example, can be made from Pinot Blanc, Riesling or Pinot Gris. Some Alsace Crémants are single-varietal wines, while others are blends. But all exhibit dryness and freshness. In both these sparkling wines, the second fermentation, which gives the wine its bubbles, must happen inside the bottle. All Champagne wines must spend at least 15 months in the bottle before release, and for Crémant it is a minimum aging period of 9 months. 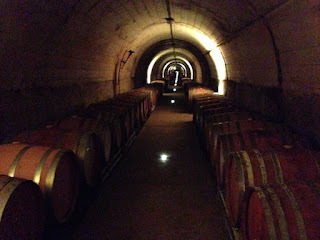 This maturation gives the wines their rich and creamy texture. Spain produces Cava which predominately uses Macabeu, Parellada and Xarello. Cava' s tend to be light bodied, pleasantly acidic and fruity. They also use the same production process as Champagne, where the second fermentation happens inside the bottle which gives the wine its bubbles and a creamy texture. Moscato d'Asti, Prosecco and Lambrusco are well known sparkling wines produced in Italy. Moscato d'Asti is made from the Moscato Bianco grape, has low alcohol and flavors of fruit and honey, which gives it a sweet taste. Prosecco produced from the Glera grape, tends to be crisp, aromatic with flavors of apple, peach and apricot. Lambrusco made from a red grape with the same name as the wine, is light bodied, clean and refreshing with flavors of cherry, strawberry and raspberry. Germany, Austria and some parts of Eastern Europe produce Sekt. A German Sekt, produced with Riesling is usually lower in alcohol as compared to Champagne, sweet with aromas of apples, pears and white flowers. In America, the grape varieties used for making Sparkling wine depends on the region and the winemaker who might often produce a blend using different grapes. With so many different Sparkling wines to choose from, it may seem a difficult task of selecting a wine for food pairing. However it isn't, and there neither exists a standard rule that mandates which wine to pair with food. Wine and Food are a matter of personal preference and our palate is constantly evolving as we try new things. There are a few simple ideas and guidelines to keep in mind which will enhance the food and wine pairing experience based on understanding the characteristics of the food and the different wines. When food and wine have similar qualities, they complement each other and enhance the textures/flavors that they have in common. 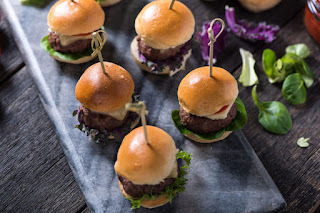 If you are serving meat appetizers like beef sliders, pulled pork sliders or bacon-wrapped anything, look for a sparkling wine made from red grapes like Pinot Noir, Pinot Meunier, Lambrusco or even a Sparkling Shiraz from Australia. These wines have the flavor, tannins and the structure to complement these meat appetizers. Appetizers likes mushrooms in cream or butter sauce, homemade macoroni and cheese, creamy mushroom risotto pair perfectly with a Champagne or a Crémant as these wines tend to have a rich creamy texture besides good acidity. 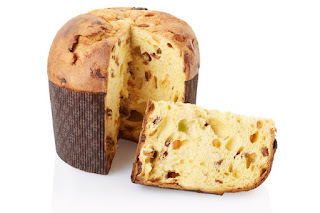 Sparkling wines like Moscato d'Asti which are sweet and have less alcohol, pair well with apple pie, hazelnut or almond cake, panettone which is an Italian sweet bread, or fruit based desserts. It is important to pick a wine sweeter than the dessert as the sweet wines showcase the sweet flavors in food, but if the food is sweeter than the wine, the wine will taste flabby. Here's the bottom line: Even if you don't admire sweeter-style sparkling wines on their own, try them with a cake or panettone and you‘ll be pleasantly surprised. Sometimes the contrast in flavors can create a great pairing. Pair spicy foods with sparkling wines that have some residual sugar like the German Sekt or Moscato d'Asti. Residual sugar actually cools down spice and creates balance between the food and the wine. These wines also have low alcohol and therefore make a good pairing, as high alcohol tends to make the dish seem even spicier. Deviled eggs with Romesco sauce or peppers, spiced prawns or Jamaican jerk chicken will pair well with a German Sekt or Moscato d'Asti. Any kind of sparkling wine is a good pairing with anything salty, fatty or fried. The bubbles and the natural acidity scrub the fat off your tongue and get it ready for another bite. 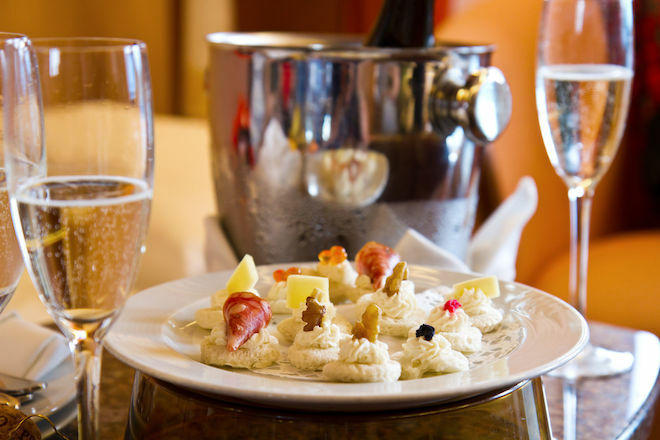 Pair Prosecco with salami and cheese or Cava with dry-cured chorizo, jamón serrano or jamón ibérico, Champagne or Crémant with fried calamari or smoked salmon. Our tastes are subjective and each has their own food and wine preferences. These are just a few simple ideas and guidelines to keep in mind which will enhance the food and wine pairing experience based on understanding the characteristics of the food and the different wines. Ultimately, the most important pairing rule to follow is to drink what you like ! Rodolfo, Great article with information useful to novices like me!! 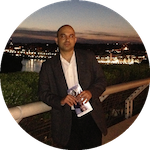 Congratulations on the new blog; I look forward to attending some events this year. Take care! Thank you Elizabeth ! We look forward to seeing you at our events soon.